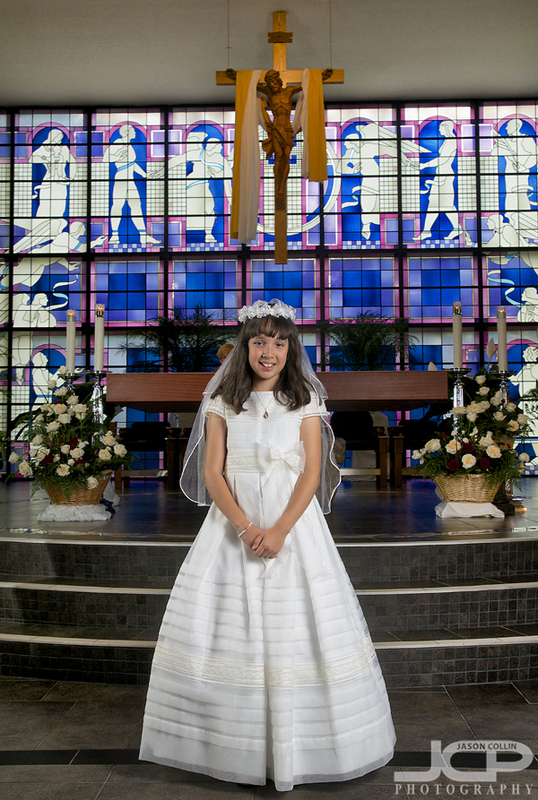 First communion for Juliana at St. Paul Catholic Church in Tampa Florida - Nikon D300 Nikkor 80-200mm @ f/7.1 ISO 200 1/125th - Strobist: SB-800 in brolly & SB-600 in shoot-through-umbrellaI first photographed Juliana and her family in 2010 for her 7th birthday party. 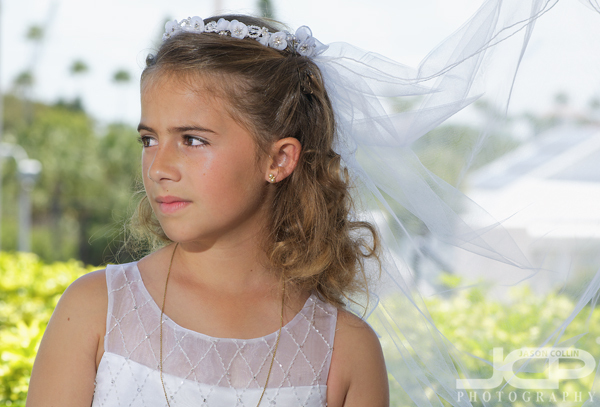 This past weekend I photographed her first communion at St. Paul Catholic Church in Tampa, Florida. I have now photographed her and her family a total of four times. It is always great to work with past clients, and there is no family I have been with longer than Juliana's. 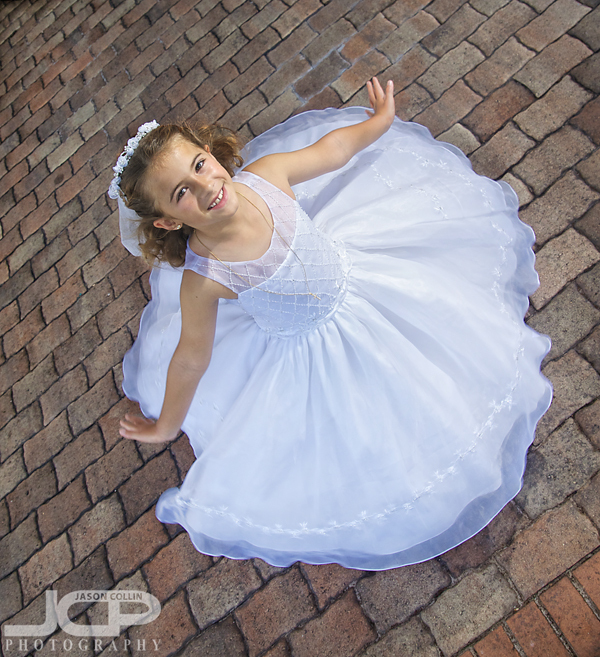 Thankfully, since day one, Juliana has been a natural in front of the camera! The above shot will for sure be one of my five favorites of 2014. I heard that Juliana's mom cried when she saw this photo. 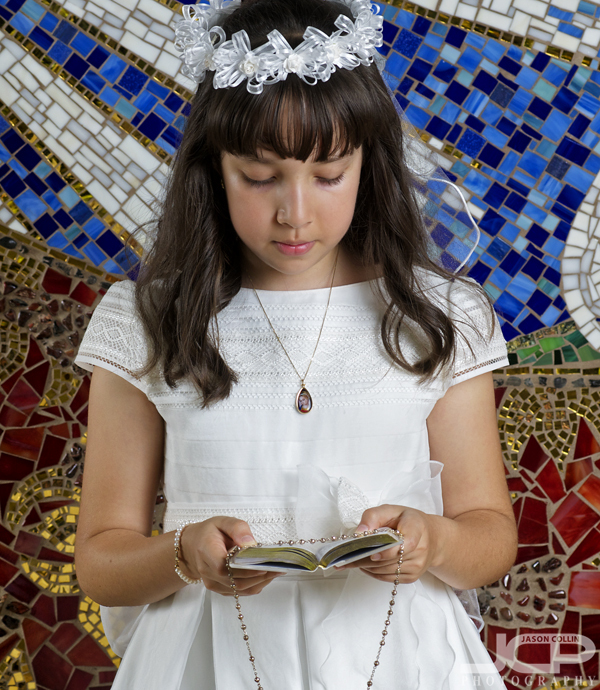 I first photographed Juliana at her 7th birthday party, now her first communion - Nikon D300 Nikkor 80-200mm @ f/7.1 ISO 200 1/125th - Strobist: SB-800 in brolly & SB-600 in shoot-through-umbrellaI met Juliana about an hour before the first communion ceremony would begin. 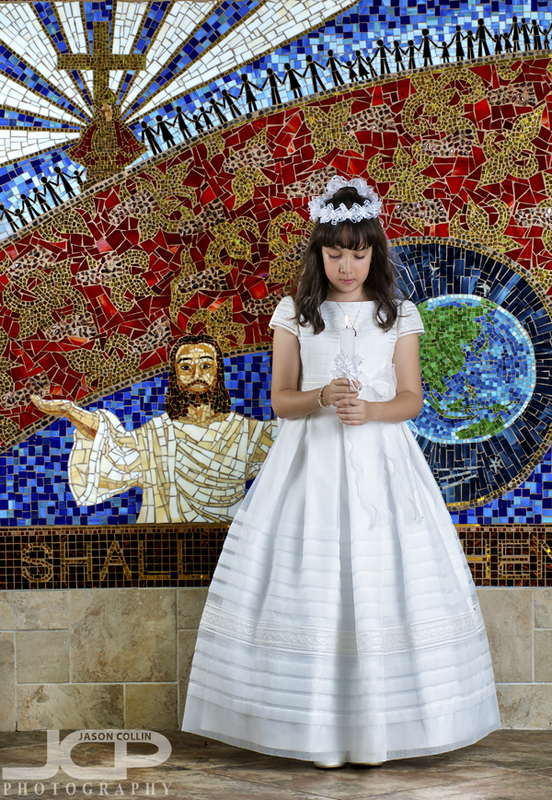 The church had a great mosaic pavilion in a quiet garden that we used as a background for several portraits. No one was around and there was no wind, so I had not trouble setting up two speedlights on light stands for making strobist (off camera flash) portraits. While I was setting up another shot, I saw Juliana lean back with her feet up & said hold that pose! - Nikon D300 Nikkor 80-200mm @ f/7.1 ISO 200 1/250th - Strobist: SB-800 in brolly & SB-600 in shoot-through-umbrellaJuliana almost needs no instruction when I photograph her as she just naturally has an ability to be creative. While I was moving the light stands I noticed her sitting back and putting her feet into the air and I thought that looked great. I said hold that and it turned out to be one of her family's favorite shots of the morning. I may never have thought of it on my own, so creativity of the person in front of the lens is also very important. Just before the ceremony starts in St. Paul Catholic Church Tampa Florida first communion photography - Nikon D300 Tamron 17-50mm @ f/8 ISO 200 1/60th - Strobist: SB-800 in brolly & SB-600 in shoot-through-umbrellaThere was not much time to shoot inside the church itself, so I quickly carried in my lights and tried to frame the best shot I could. After this solo one of Juliana, a few family members joined her before we got the sign to wrap it up! 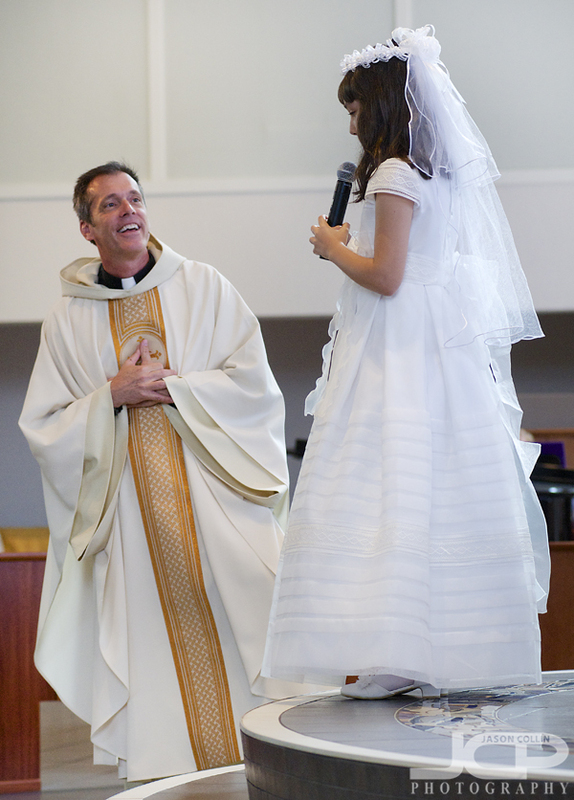 Speaking in front of the whole church Juliana was calm and articulate - Nikon D300 Nikkor 80-200mm @ f/4 ISO 1000 1/100th on monopodDuring the first communion ceremony I was not allowed to use flash or move around at all. So I sat in a pew on the other side of the church, cranked up the ISO, put my Nikon on a monopod for extra stability (and to absorb the weight during the hour I was sitting) and looked for candid photograph opportunities. To my surprise the priest asked Juliana to get up in front of the whole church (several hundred people) and give a little talk! She did not know she would be talking either, but did great. I was impressed with her answers and articulate responses. Mother & daughter share a warm embrace after her first communion ceremony in Tampa Florida - Nikon D300 Tamron 17-50mm @ f/9 ISO 200 1/250th SB-800 hotshoe mountedAfter the ceremony there was a celebration at a restaurant. I followed them to the second location where it was time for a few warm embraces and then cake! 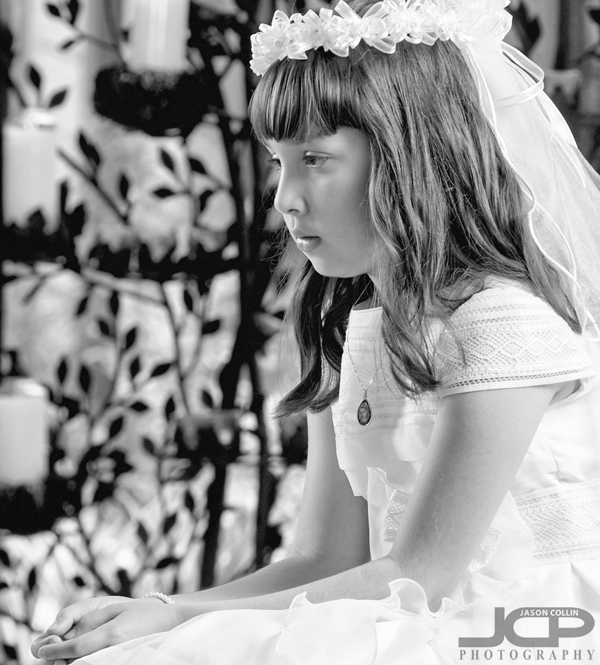 Deep in thought on her first communion at St. Paul Catholic Church Tampa Florida - Nikon D300 Nikkor 80-200mm @ f/7.1 ISO 200 1/125th - Strobist: SB-800 in brolly & SB-600 in shoot-through-umbrellaI always like to make a photograph of someone thinking, especially on important occasions such that 20 years from now when they look at the photo again they may remember what they were thinking, thus giving the photograph extra meaning only to them. 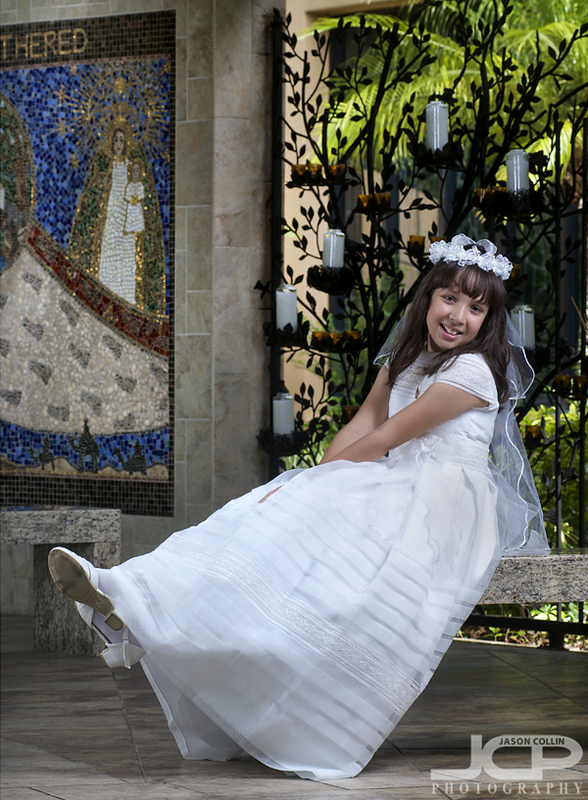 Reserve First Communion or other celebration photography for your family event today! 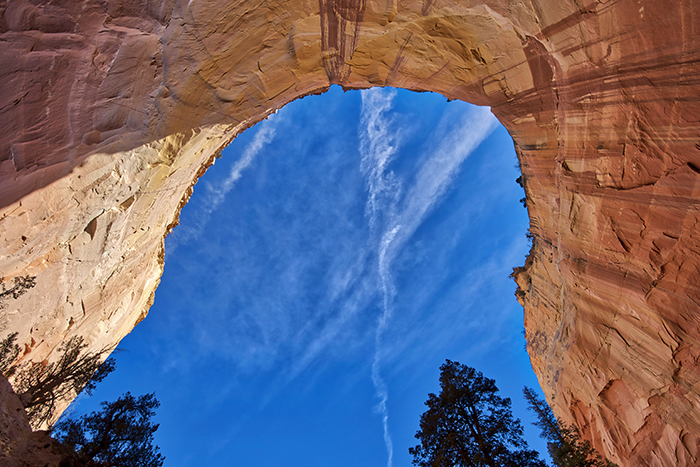 Take a 1-on-1 DSLR Photography Lesson with Jason to learn how to make shots like this yourself! Isabella dancing at her first communion celebration at the Don Cesar St. Petersburg Florida - Nikon D300 Tamron 17-50mm @ f/5.6 ISO 200 1/200th Strobist: SB-800 with diffuser cap @ 1/4 power to frame rightPhotographing Isabella at her First Communion Celebration at the Don Cesar in St. Petersburg, Florida was a lot of fun and allowed me to make what I am sure will be one of my ten best images of the year (above). Last week it was my pleasure to have two returning clients within a few days of each other. 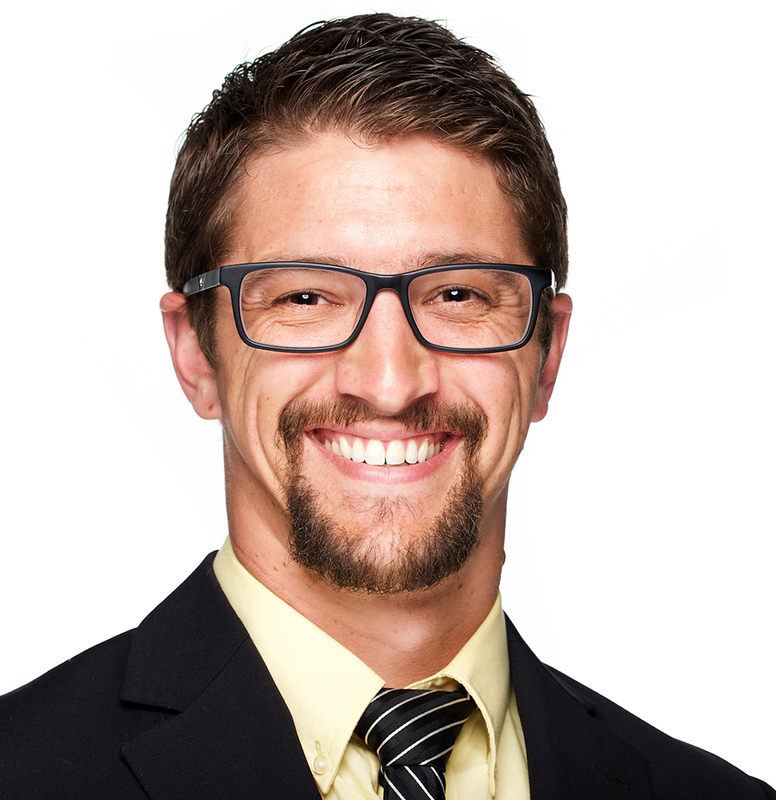 I really appreciate clients who continue to choose me as their photographer, and from a shooting standpoint, it is great to have that already existing familiarity with the client. This time, however, instead of just shooting Vanessa during one of her professional flamenco dancing performances (dance 1, dance 2), as mentioned above I was able to photograph her daughter Isabella and the rest of her family as well. 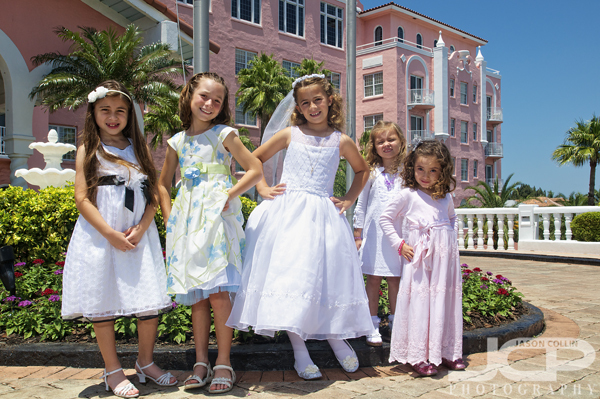 Isabella (center) and friends with the Don Cesar in the background - Nikon D300 Tamron 17-50mm @ f/11 ISO 250 1/200th Strobist: SB-800 with diffuser cap @ 1/4 power to frame leftThe Don Cesar is a great location to shoot at, although at the time of the event (12:30pm to 1:30pm) the midday Florida sunshine was as it always is, harsh and unforgiving to photography. Further, to keep things simple and quick for the girls in the photo I used only a single speedlight (SB-800) with a diffuser cap on a light stand to make these shots. Can you spot the ones that were made in direct sunlight and the ones that were made in the shade? Isabella showing off the back of her pretty first communion dress, Don Cesar in the background - Nikon D300 Tamron 17-50mm @ f/13 ISO 250 1/200th Strobist: SB-800 with diffuser cap @ 1/4 power to frame leftVanessa wanted a photo of the back of Isabella's pretty dress so I tried to make it a kind of model shot by having Isabelle look back at me over her shoulder. I composed the shot to use the curb as a leading line along with the railing choosing to have more foreground than blue sky background. 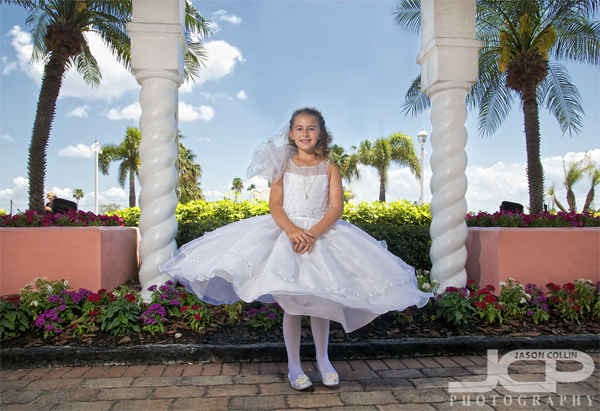 Isabelle twirling her first communion dress at the Don Cesar - Nikon D300 Tamron 17-50mm @ f/8 ISO 250 1/200th Strobist: SB-800 with diffuser cap @ 1/4 power to frame leftThe above shot was a rather tricky one to execute, that took quite a few takes, but I am glad we stuck with it and made the photo exactly as I previsualized. First, Isabelle was standing in complete shade while most of the background was in strong sunlight. I again used just my single speedlight to put light onto the subject and adjusted my shutter speed to expose the blue sky in the background. A little Photoshop dodging helped balance out the foreground. Then it was just a matter of capturing Isabelle spinning exactly centered between the two columns with her dress flowing in a good look. As I mentioned, a tricky shot, but it turned out better than I thought as Isabelle appears to be still herself while her dress has the appearance of motion creating an unusually dynamic visual. 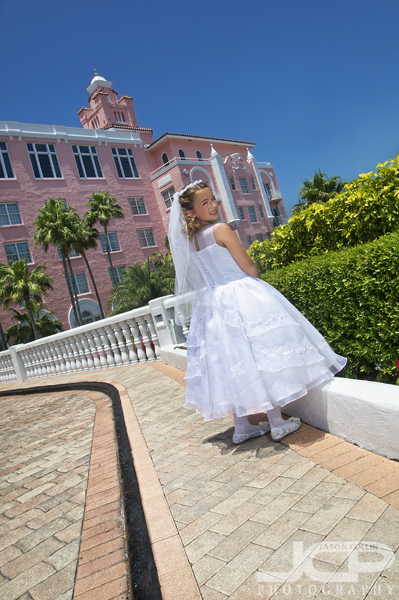 First communion dress & veil at the Don Cesar St. Petersburg, Florida - Nikon D300 Nikkor 105mm VR micro @ f/8 ISO 250 1/200th Strobist: SB-800 with diffuser cap @ 1/4 power to frame leftThis photograph is one of my favorite kind to make incorporating a veil in the wind (actually held up by her mom out of frame, shh!) and the subject looking into the distance with a contemplative look. I asked Isabelle to look to her right and think of her future. The result is the above image. This photograph paired with the top image in this post cover a wide range of emotion that I hope Isabelle and Vanessa and the rest of her family will find valuable when they look back at these photos in 10, 20 years from now. I want Isabelle to wonder what she was thinking at that moment. I wonder if she will be able to remember . . .